NC Business Hall of Fame -- Thomas J. Hackney, Jr.
Tom Hackney successfully led the Hackney Brothers in the truck building business for more than 60 years. The North Carolina manufacturer was the longest lasting firm that started as a buggy and wagon manufacturer. 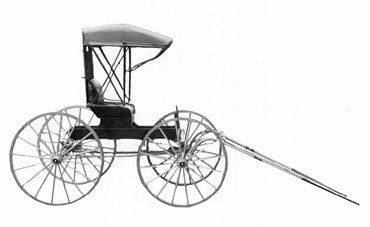 Junior Achievement Hackney Brothers, Inc., began manufacturing buggies in Wilson, N.C., in 1854. 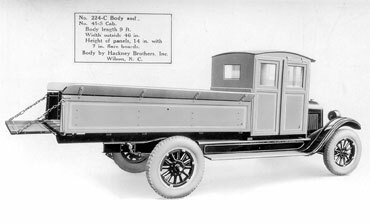 After the automobile became popular, the company expanded its product line to include ambulances, house trailers, hearses, portable storage rooms, temporary bleachers, car-top sleepers, and school buses. The company patented the first carbon dioxide-based refrigeration system in 1931 and began a profitable specialization in refrigerated cars and carts. Milk trucks became its most important product. Tom Hackney began helping out the Hackney Brothers firm when he was still in high school, delivering refrigerated trucks to Durham. He graduated from the University of North Carolina at Chapel Hill in 1941. He worked briefly for the firm in 1941-1942, before joining the armed services during World War II. He served as a lieutenant in the U.S. Navy from 1942 to 1946. Tom Hackney returned to Hackney Brothers in 1946, becoming secretary-treasurer in 1947. He served in that capacity until 1956 when he became president. The two big product lines for Hackney Brothers were refrigerated trucks and buses, primarily school buses. In the booming 1950s, there was soaring demand for Hackney's refrigerated trucks, while the school bus line faced dwindling profits and standardized in these buses in the early 1960s. One of Tom Hackney's key decisions was the discontinuance of the school bus line in 1962, concentrating on refrigerated trucks. In 1977, Hackney Brothers expanded their operations by starting a new plant in Fayetteville, Arkansas. The new plant opened in May, 1978. After success in the milk-truck industry up until the mid-1980s, the demand for the product sharply declined. TTI, a private company owned mostly by the H.I.G. Investment Group, bought Hackney Brothers, Inc. In 1996, TTI closed the company and moved production to Hackney and Sons Company in Washington, N.C., which was founded by a relative of the Wilson Hackneys. Tom Hackney served as chairman for the North Carolina Citizens Association, Atlantic Christian College and the Wilson Industrial Council. He served on many boards, including First Union National Bank and the News & Observer Publishing Company.